Sometimes you have to step back a few paces to see how much conservatism has distorted the public debate. Case in point: employment. Somehow the right has managed to stigmatize public-sector jobs so effectively that only politicians of rare and admirable courage are willing to defend them. Unfortunately, those politicians seems to be in short supply nowadays. 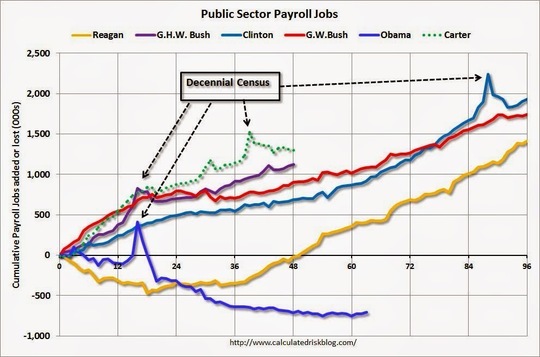 Public-sector employment grew by more than 1 million jobs under five of the last six presidents. Who was the exception? 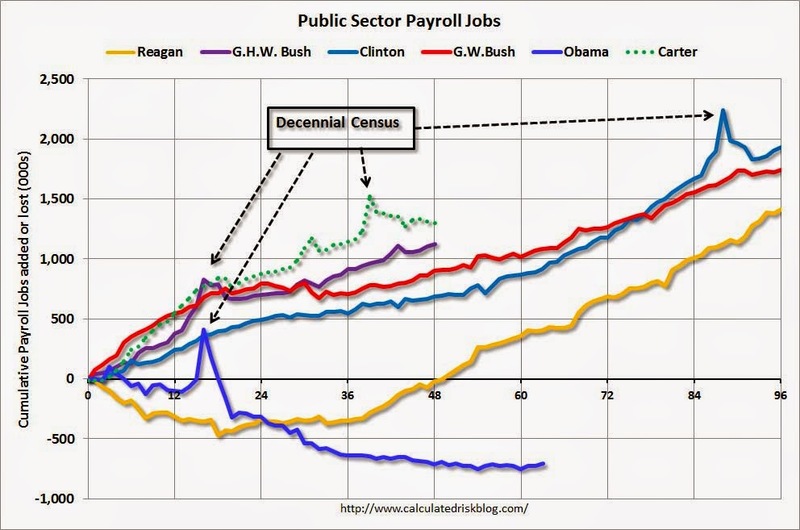 If you guessed conservative icon Ronald Reagan, guess again: During Reagan’s two terms 1,414,000 public-sector jobs were added. If you guessed Bush the Elder or Bush the Younger, that’s two more strikes. And if you guessed Bill Clinton, who liked to rail against “bureaucrats” and talk about “leaner” government, you were way off. Nearly 2,000,000 jobs were added during Clinton’s presidency. The outlier is Barack Obama. 710,000 public-sector jobs – that’s nearly three-quarters of a million – have been lost since Obama took office. President Obama is not the architect of these losses. Most of them have taken place at the state and local level, although federal jobs are now gaining a larger share of the losses. At every level, job loss has been fueled by Republican-backed cuts and stymied by conservative hostility toward government jobs. That hostility succeeds by ensuring that the public never stops to think about who those government employees really are. It only takes a moment’s reflection to realize that they’re the teachers who educate our children, the police and firefighters who keep us safe, the sanitation workers who keep our streets clean, the Social Security employees who make sure the elderly and disabled receive their benefits, and dozens of other productive members of our communities. And it only takes another moment to remember that these government employees are our friends, our neighbors, the fellow citizens whose taxes contribute to the smooth workings of government and society. The primary responsibility for these job losses lies with Republican extremists who are determined to dismantle government at all levels, and at any cost. But a Democratic president should be a voice for reason, challenging the extremism of the right and fighting to help these government employees regain their rightful place in our economy and in our society. The president has chosen instead to shy away from a full-throated endorsement of government employees as a positive force in our lives. His jobs proposals, while not without merit, are far too small – and far too tentatively presented – to change either the political or economic equation. The facts are these: Given the growth of the population, stagnating wages, persistent long-term unemployment, and a host of other factors, we should be adding twice as many jobs per month as we are currently seeing. Instead, government – the one area of our economic life over which politicians have direct control – is shedding jobs instead of adding them. This worsens the overall economy while depriving the public of much-needed government services. What’s more, the American Society of Civil Engineers has estimated that it will take $3.6 trillion to restore our nation’s infrastructure. We need the jobs, and the infrastructure needs repair. The president and his party should be hammering the message home every day: we need government jobs, and we need them now. Clinton’s Republican-lite messaging was dead wrong, and so is Barack Obama’s. The Republican, right-wing assault on government employees – human beings they prefer to smear as “faceless bureaucrats” – is relentless, nasty, and brutal. The success of this anti-public-worker campaign depends on keeping them faceless, something alien and slightly less than human. Politicians who seek populist/progressive support should stop repeating the antigovernment nostrums of the right and start challenging them instead. It’s time for genuine leaders to push for a bold public-sector jobs program, fearlessly and without cynicism. And it’s time for someone to defend the hard-working employees in the public sector – human beings who contribute as much to our well-being as working people in any other walk of life. It’s time for leaders of conscience and courage to stand up for these hard-working Americans. As long as any worker can be dehumanized, all working people can be. If government workers are abandoned by the political class, our job numbers will continue to fall – and both our economy and our society will be worse off for it.